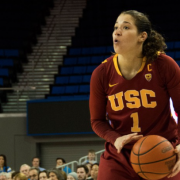 Fresh off a Women’s National Invitational Tournament run, the USC’s women’s basketball team garnered much attention in the preseason, as they landed in the preseason Associated Press top-25 poll for the first time since 2006. USC was also picked to finish second in conference behind Stanford, according to a Pac-12 coaches poll. But for the third-straight season in the Michael Cooper era, the team fell short of an NCAA tournament bid. The season was a disappointment. Expectations were not fulfilled. “This is just a hard moment to talk about because our dreams and visions were much further than this, but it ends today,” Cooper said following the team’s 69-55 defeat to Washington State in the quarterfinals of the Pac-12 tournament. And he was right. There would be no celebration on Selection Monday. There would be no March Madness experience for the Women of Troy yet again. 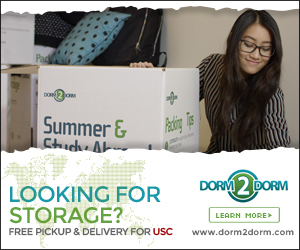 For a program with as much history and tradition as the USC women’s basketball program has had, there is no consolation prize. Success is expected. Winning is expected. Falling short of the playoffs time and again isn’t good enough. And it’s really mind-boggling, to say the least. Cooper’s two recruiting classes in 2010-11 and 2011-12 have been ranked No. 7 and No. 8, respectively. In 2010, forward Cassie Harberts was the prize of the class as the No. 11 overall recruit, and she has been a fixture in the starting lineup for the Women of Troy since stepping foot onto the USC campus. This year freshman guard Ariya Crook (No. 2 point guard in the nation according to ESPNU) and freshman forward Alexyz Vaioletama (No. 6 power forward in the nation according to ESPNU) saw significant playing time. The team has been loaded with players not even recruited by Cooper, too. Senior guards Ashley Corral and Briana Gilbreath have been the backbone of the program for the last three seasons under Cooper. Both were All-Pac-10 Team selections last year. Junior forward Christina Marinacci has played a pivotal role in the team’s success during all of Cooper’s years as coach. Even senior guard Jacki Gemelos — when healthy — provided the team with playmaking, outside shooting and leadership in her first full season with the team last year. With eight All-Americans on the roster — seven that could contribute taking into account Gemelos’ season-ending knee injury in mid-December — and each one of them playing a key role on the team, there wasn’t a sliver of doubt in my mind that this team could be really special this year, especially considering the circumstances. UCLA, a team picked to finish fourth in the conference, had lost its coach, Nikki Caldwell, during the offseason when she chose to leave for Louisiana State University. Senior forward Jasmine Dixon ruptured her Achilles heel in mid-September and was ruled out for the entire season. Their starting point guard from last year, Doreena Campbell, had graduated. In short, they were going through a transition phase. California, picked to finish third in the conference behind USC, had guard Alexis Gray-Lawson to the WNBA. Gray-Lawson finished second in the Pac-10 in scoring last season. The Golden Bears also dealt with the loss of forward DeNesha Stallworth, who transferred to Kentucky. These two teams were USC’s main competitors outside of Stanford, the unanimous pick to finish first in the Pac-12 for the 11th consecutive season. The Women of Troy’s recognition was rightfully deserved, too, with the amount of talent and experience returning. USC started conference play 5-1, with its lone loss coming against Stanford. Even in that game, USC led midway through the second half. But as fast as they started, the Women of Troy hit a bumpy patch, losing five of their next seven games. Three of those losses came against Colorado, Utah and Washington — teams that finished below .500 in conference play. USC recovered to win its last six games of the regular season, though. But then came the dagger — the loss to No. 11 Washington State in the Pac-12 tournament. It was shocking. It was disappointing. In the last three years, the Women of Troy have fallen short. They’ve been on the outside looking in. They haven’t had that punctuating season you’d expect from a group this talented. Next year could be different, but again, I’ve been thinking that for some time. Losing Corral and Gilbreath hurts, but Marinacci and Harberts will be back. Along with Crook, Vaioletama and junior Stefanie Gilbreath off the bench, that’s still a solid core returning. But can USC get to the tournament with Cooper at the helm? I love Coach Cooper. I wish more people would give him a chance. I’m starting to come around. One error, rather major….Alexis Gray Lawson left Cal two years ago. She didn’t play in the WNBA her first year out of school, but did play overseas. She was picked up by Phoenix this past season. Also, you should have noted the coaching change at Cal. Joanne Boyle left for Virginia and was replaced by Lindsay Gottlieb. Cal has no seniors on this year’s squad. The worst thing USC ever did was NOT renew the contract of Chris Gobrecht. She was turning this program around, she inherited a hot arse mess. It took a few years with all the injuries they had, but she was winning, and playing top 20 teams. U bring in the other coach from Pepperdine Mark Trakh, who was using GObrecht’s recruits, was lucky for two years, then the wheels fell off LOL, he was let go. Now Michael Cooper is in ther and the prigram was in good standing, somewhat but he can’t do anything with the team. Mike Garrett & Lisa Love supposedly fired Chris Gobrecht, and both are NO LONGER a part of USC LOL, go figure! This program will forever be down trodden, the glory days of Cheryl Miller are long gone. USC had the chance with Chris Gobrecht, but blew it. Not sure that Stefanie Gilbreath will return for her extra year. Ask Cooper why he let some of the best recruits leave southern California for UConn and Texas which would make a big difference. He needs to upgrade the coaching staff with someone who has been with a successful program that knows what it takes to be a contender.